In the immediate aftermath of Anders Behring Breivik's terrorist attack in July 2011, I figured out from his writings that he is not himself a counter-jihadi but adopted the pretense of being one so that he could purposefully damage "conservatism, the counter-jihad, and (in particular) those authors he cited in his writings." This weblog entry pursues that interpretation. The American writer Daniel Pipes — one of many individuals who have been grossly misused in the so-called manifesto — hypothesized early on that Breivik's intention may have been to damage those that he quoted in his compendium precisely because they are not violent. Among other things, he mentions there that his limited involvement with the Progress Party in Oslo will probably be used against that party in public. Breivik actually liked this idea. This theory has been considerably strengthened by the fact that Breivik stated openly and repeatedly during the trial that he wanted to unleash with his actions and his manifesto a "witch-hunt" on moderate voices and non-violent critics of Islam and immigration. Unfortunately, he has at times been quite successful in his efforts. In this regard, most of the mass media and the political establishment have essentially acted as Breivik's useful idiots from day one. Jan. 24, 2014 update: Breivik has sent a letter to the media in which he makes more explicit than before that he is not an ally of those fighting Islamism; rather, he reveals his Nazi outlook. "Baron Bodissey" provides the text of Breivik's letter and fleshes out its important implications today at the Gates of Vienna website. "Baron Bodissey" then recounts his successful effort to get the Breivik letter, written in English and titled "Explanations, clarifications and the peace proposal – NRK, TV2, Aftenposten, VG and Dagbladet (< >),are refusing to consider." The first page of Anders Behring Breivik's September 2013 letter to the media. It turns out that this letter was written in September 2013 but not released by the Norwegian prison authorities until early January. Baron Bodissey notes that Breivik refers to his huge document, 2083 — A European Declaration of Independence, not as a manifesto but as a compendium, a significant distinction. The mainstream media have been had. They were played like a fiddle by Anders Behring Breivik, and now they know it. That's why they're keeping quiet. They're hoping that this snippet of news can remain their little secret. If they can keep it quiet, they won't have anything to worry about for twenty years until the killer gets out of prison. But, hey – most of them will be retired and drawing their generous state pensions by then, so what difference does it make? ... his original story – the one that gullible Norwegian journalists bought hook, line, and sinker – has been revealed as pure hokum. Jan. 27, 2014 update: Fjordman reflects on the same issues in "Breivik's Confession and the Media's Silence," and specifically his alleged role as Breivik's mentor, at FrontPageMag.com. Breivik now declares that he is a Nazi and despises me because of my alleged "Jewish network." In his letter he praises Tore Tvedt, Varg Vikernes, Erik Blücher and Nicolai Kvisler. They are all among the (very few) genuine neo-Nazis in Norway. He further states that "When the norwegian MSM announced that Fjordman was my role model and idol, they couldnt be more wrong. These four individuals, on the other hand, are all worthy of trust, respect and praise, due to their past and continued efforts." I've been widely portrayed as Breivik's "mentor" and viewed as morally co-responsible for mass murder. We now have Breivik's own confirmation that those presenting such claims "couldn't be more wrong." 1. Anders Behring Breivik is just plain insane, and there is no point in taking anything he says seriously at all. 2. Anders Behring Breivik specifically wanted to instigate a mass media "witch-hunt" on peaceful anti-Islamists. He said both during the trial in 2012 and in this letter from 2014 that he's very satisfied with the way the media behaved. The Western mass media have portrayed ABB [Anders Behring Breivik] as a rational and sane person who was inspired to commit mass murder by texts written by me, Robert Spencer and other Islam-critics. This viewpoint can no longer be presented as the truth. It is false, and always has been. He is almost certainly insane. To the extent that he is rational about anything — which is highly debatable — ABB has been very explicit for years that his intention was to use the mass media as allies to damage Islam-critics such as Robert Spencer, Bat Ye'or, Daniel Pipes or Fjordman as much as possible. Claims made by the established media that Breivik is an anti-Muslim terrorist are incorrect and should be rejected. He admired the Islamic Jihadist terrorists of al-Qaida, and copied them in order to kill non-Muslims and marginalize peaceful Islam-critics. The attacks of July 22 2011 are first and foremost a story about how many families lost their loved ones due to the actions of a sadistic and deeply sick individual. However, these events were cynically exploited in a political witch-hunt, much to the satisfaction of the terrorist himself. The media who participated in this witch-hunt have so far been unable or unwilling to engage in some healthy self-criticism over their unfair smears against their ideological opponents. Comments: (1) Breivik's Nazism could not be more clear. (2) His letter provides confirmation of my thesis about Breivik wanting to harm, not help, the counter-jihad. (3) Shame, once again, on the mainstream media for burying an important document that does not fit its damage. 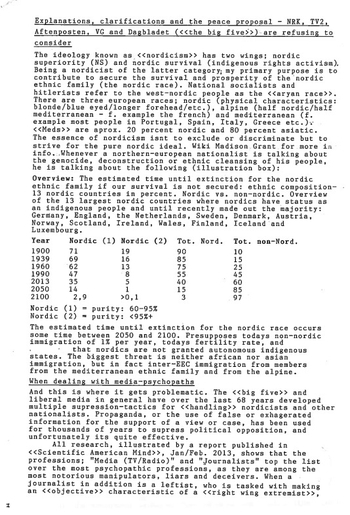 (4) So much for fine-toothed statistical analyses of 2083; we now know Breivik's intentions directly from himself. Mar. 15, 2016 update: If further proof of Breivik's political orientation were needed, he made a Nazi salute in a courtroom today. 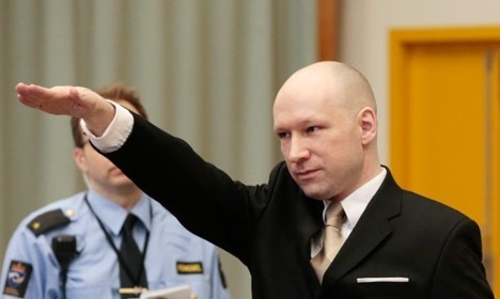 Anders Behring Breivik making the "Heil Hitler" gesture. Mar. 15, 2019 update: Has Brenton Tarrant, the mass-murderer of Muslims in Christchurch, New Zealand, imitated Breivik in purposefully discrediting respectable conservatives? It is hard to understand why else he would call his manifesto The Great Replacement, using a term coined by Renaud Camus, or why he says of Candace Owens that she is "the person that has influenced me above all," adding that he disavows "some of her beliefs" because "the extreme actions she calls for are too much, even for my tastes." Mar. 26, 2019 update: Tarrant gave a hefty €1,500 donation to Martin Sellner of Austria, thereby harming if not ruining Sellner's reputation. A search of the Middle East Forum's database, fortunately, shows no donations from Tarrant.